Private water provides the opportunity to pursue trophy trout in unique solitude. 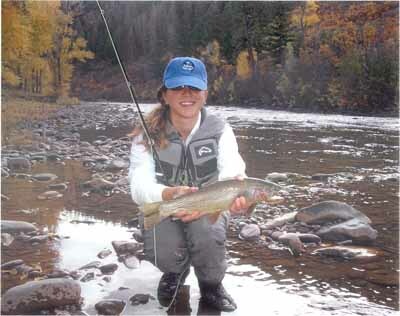 Telluride Angler has many miles of exclusive guiding access on the Dolores and Uncompahgre rivers, plus intimate small stream water on the grounds of Dunton Hot Springs and Fish Creek Ranch, both on the West Fork Dolores. Please review the following "Private Water Menu" for a complete list of exclusive locations. Crown jewel of the San Miguel, Cascabel Club offers 3 contiguous miles of private water in Norwood Canyon. This is the best water on the San Miguel, notable for its structure, habitat variety, fish size and profusion of aquatic insects. No longer operated as a fishing club, our lease at Cascabel offers anglers the opportunity to fish a section of the San Miguel that has been protected for more than 30 years. 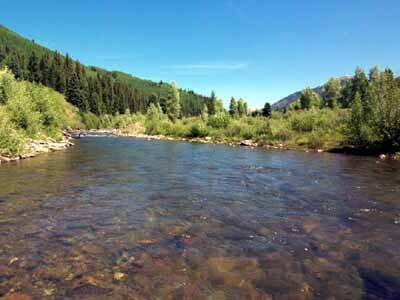 This fantastic new Telluride Outside fishing property offers an honest 1.5 miles of the Upper Dolores in the scenic section of river valley between Taylor Creek and Redburn's Ranch. The Bayless Ranch is accessed by a driveway that centerpunches the very best fishing water, allowing reasonable fishing access for both half day and full day trips. You would have to fish this property 3-4 times just to cover all of its runs, riffles and pocketwater. An heirloom ranch of arresting serenity, Redburn's is a cornerstone landmark in the Dolores valley. Located just upstream of the river's forks, Redburn's offers the compelling combination of unfished water, easy access and stunning scenery. Telluride Outside is proud to offer exclusive guiding services on Redburn's Ranch, a crown jewel for our guide service. The Upper Dolores forms a dreamscape of pools and riffles as it wanders along the treeline at the back of the ranch. Aquatic insects, especially caddis and PMDs, hatch profusely from the cobbled streambed. Terrestrials, such as grasshoppers and ants, blow in from meadows to the west of the river. Every technique works here: dry fly fishing, nymphing and streamers. The Roaring Fork Ranch offers 1 1/2 miles of exclusive private access along one of the most beautiful sections of the Upper Dolores River. Here, the Dolores consists of fast-moving pocketwater interspersed with a handful of deep pools. It's terrific natural fish habitat enhanced by a tremendous aquatic insect population. Surprisingly big fish are caught in this modest sized stream. Only 40 minutes from Telluride, the Roaring Fork Ranch lends itself to half day trips in addition to full day trips. The Line Camp offers over a mile of luxurious riffles, runs and pools below the confluence of the Main Fork and West Fork, upstream from the town of Dolores. This section of the river corridor is much wider and lower gradient than the fast moving pocketwater on the Roaring Fork section. Big fish enjoy roomy habitat, feeding on crawdads, grasshoppers and a host of aquatic insects. Beautiful cottonwoods line the river and huge boulders jut out from the banks. Lightenburger is also located below the forks of the Dolores. Among the most naturally gifted stretches of the entire Dolores, the Lightenburger Ranch offers a combination of quality fishing and picturebook ambience that makes for pleasant mid-winter dreams. Fish grow to great size on both the Lightenburger and Line Camp ranches. Boulder-studded pools, low-gradient runs and luxurious riffles provide superb trout habitat. Pale morning dun mayflies headline a season-long parade of aquatic insect hatches. Hoppers and crawdads are so abundant, however, that many of our guides favor large foam-bodied dry flies and streamers over match-the-hatch imitations. Located just one mile downstream from the town of Rico, Rico River Ranch offers a terrific private water destination that is reachable on both half and full day guided trips from Telluride. A half mile of the Upper Dolores River passes through Rico River Ranch. We have also leased the property immediately upstream from RRR, combining for a mile of private water. This is classic Upper Dolores pocket water with a handful of long, glassy runs in the mix. The fish population on this section of river is terrific, with rainbows, browns, brook trout and the occassional native cutthroat offering a colorful variety of trout. Rico River Ranch is for sale. We're happy to answer questions about the real estate, especially as pertain to fishing. Rico River Ranch is located in one of the most beautiful sections of the Dolores River Valley, easily accessed by scenic Highway 145 along the San Juan Skyway. The property borders tens of thousands of acres of National Forest, ideal for hiking, mountain biking and other outdoor pursuits. Bordered by Forest Service to the south, the angler has the opportunity to start fishing on public water and work up into the exclusive private water on Rico River Ranch. This is an exceptional property for the angler. More information is available at: www.ricoriverranch.com. Just west and south from Telluride, the West Fork of the Dolores River meanders through the historic mining camp at Dunton. Dunton Hot Springs has been restored as a low-profile but magnificently appointed resort with almost a half mile of private flyfishing water. The West Fork slows and braids across this broad dell. Beavers have deepened many of the channels, creating glassy pools where trout rise. Cutthroat, rainbows, brown trout and brook trout are all present. Rest and soak between fly fishing beats. If we can give the fish a break, we are welcome to join Dunton's acclaimed chef for a gourmet lunch and relax in their natural hot spring pools. Access to the resort is also available on special mountain bike and 4-WD tours. Please inquire for availability. Dunton River Camp, formerly known as Cresto Ranch, is located ten minutes downstream fromDunton Hot Springs and home to one of the most gifted trout streams in Colorado. The West Fork Dolores, known for isolation and shear beauty, passes through the River Camp for more than a mile. The West Fork is a small and accessible river, averaging only 20-30 feet in width with excellent bank access for the wading angler. 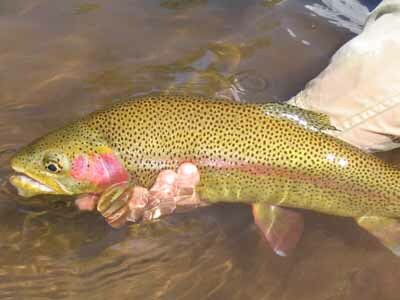 On the property, the river offers a surprising array of water types and fly fishing situations. Gentle “mule shoes” meander across meadows on the upper end, offering excellent deep water habitat for large trout. Grasshoppers are particularly effective in this section. Slowly descending, the stream bounces through aspen glades and more meadows, offering classic pocket water in the lower reaches. Here we cast large attractor flies, visible and tempting in the complex currents. If we judge rivers by their beauty, exclusivity, accessibility and the quality of their trout, the West Fork on the Dunton River Camp would earn perfect scores. On the last count, it would be hard to imagine another river of this size with equal size, quality and variety of trout. Rainbow trout are the predominant species, but brown trout are also abundant, along with the occasional cutthroat and brook trout. 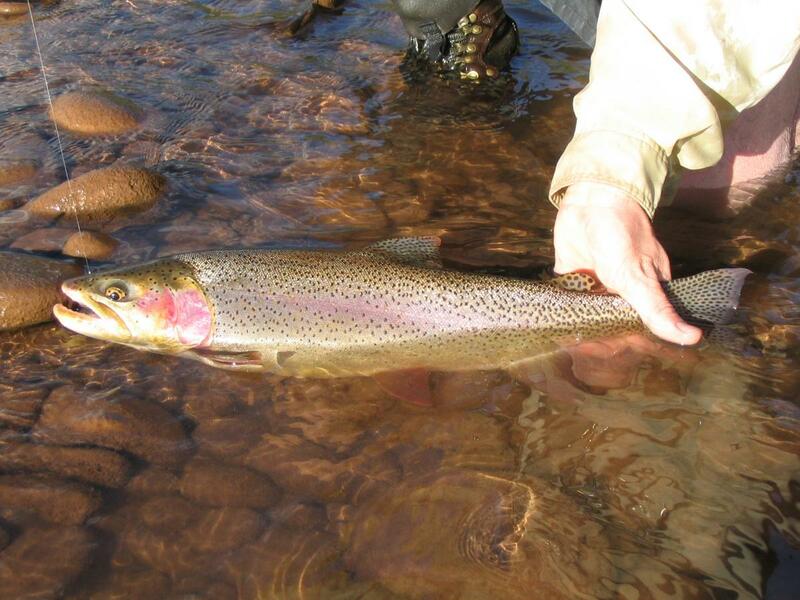 The angler may catch fish of any size, but trout in the 16”-20” range are common on this exclusive stretch of river. 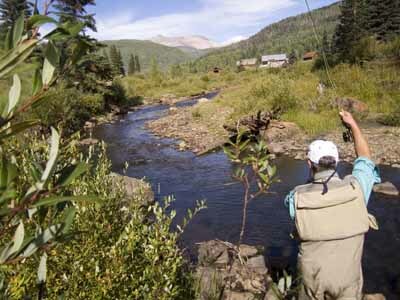 Dunton River Camp may be fished only with a Telluride Outside guide (or by staying at Dunton Hot Springs resort). The rod fee is $150/pp, or $225/pp with an elegant streamside lunch catered by Dunton. One of the most spectacular ranches in our part of Colorado, Fish Creek Ranch boasts 2 miles of private water on Fish Creek, Groundhog Creek and the West Fork Dolores. The luxurious, rustic lodge sleeps up to 10 guests. Amenities include a deck and cocktail porch with spectacular views, hot tub, game room, generous common space, a full kitchen and four exquisitely decorated bedrooms. Day use private water access costs $150/rod for Telluride Outside customers, plus standard guide fees. The lodge is available for $1,200 per night. 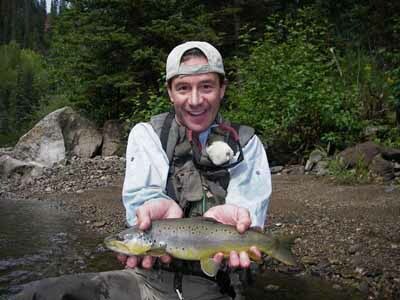 Fish Creek Ranch is highly recommended for special fishing groups, families, groups of couples and corporate retreats. There is no place in SW Colorado where the views are finer, the fishing more exclusive, or the solitude more genuine. Did you know that Telluride Outside employs four top-notch chefs? Ask about our custom catering for guests at Fish Creek Ranch. Musical entertainment, provided by Telluride Outside guide William Smethurst, is also available for special events and parties. For an unforgettable fly fishing getaway, visit Fish Creek Ranch this summer! Please inquire for availability and logistical recommendations. One of our favorite winter flyfishing destinations, "Jackson Hole" on the Uncompahgre River holds abundant fish right through the season. The river here is characterized by low gradient runs, pools and cut banks, perfect habitat for heavy trout. Catching fish at "Jackson" is a question of timing. The Uncompahgre follows a sort of reverse logic in its water flow schedule. Flows in the lower Uncompahgre are often high during the traditional low water period of mid and late summer, when irrigation calls from Montrose farms pull lots of water from Ridgway Reservoir. When the floodgates are shut off in September, flows drop substantially and Jackson Hole's many riffles, runs, pockets and pools become imminently fishable. 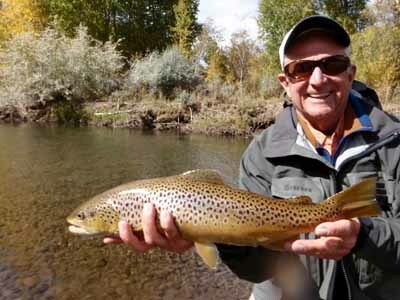 The fish are there all year around, but we fish Jackson Hole more from October through April than in the summer months. Additional rod fee: $100.